We had a pretty busy weekend around here last weekend - Uncle J (my brother) got married! I offered to make the lovely couple cupcakes instead of a wedding cake, it seemed to go well with the fun, cocktail reception they had planned. I loved getting to contribute something and my contribution was about 200 cupcakes, seen here on the awesome stand I got at Cupcake Tower (medium size). We had Almond Pound cake with Vanilla Buttercream, Red Velvet with Cream Cheese Frosting and Cappuccino Chocolate Chip with Mocha Buttercream. The bride and groom enjoyed cutting their cupcake and the stand was instantly emptied as soon as they walked away from the table - a hit, yay! I had been debating with my husband and BFF about whether people would eat more than one and I thought (against everyone else's opinion) that people WOULD in fact eat more than one because there were a variety of flavors. I'm happy to report that I spoke to more than one guest who sampled ALL THREE flavors. Sweet. If you're interested I can tell you that I allowed a cupcake and a half per person and that seemed to work out well. Check out the post-ceremony shoe and jacket change - that flower girl already has a mind of her own when it comes to fashion! She LOVED the flowers petal filled basket and took the job of emptying and refilling it very seriously. All night and on into this week. Give that girl a job and she will get it done! So now that our big event has been successfully crossed off our list I'm hoping life will be settling down a little bit. I took my sewing machine to get serviced and learned that I'd been using the wrong bobbin for oh, the entire time I've owned it! Whoops! But that's a story for another day. So anyway, back to sewing, baking for fun and life as normal as possible! 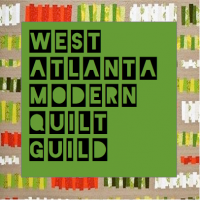 Atlanta Modern Sewing Guild NEWS! Hi everyone! The Atlanta Modern Sewing Guild has some exciting news - we are now going to be having TWO sewing days a month at Whipstitch! Not familiar with AMSG? It's just a group of like-minded ladies who meet at Whipstitch to share a love of sewing, meet some new people and get help and/or inspiration - think of a modern sewing circle. Deborah has been gracious enough to support our group with free space to sew and a great atmosphere filled with lovely fabrics and people! So our NEW schedule is going to be an open sewing day on the second Saturday of every month, from 8AM till noon. The fourth Saturday (also 8 - 12) we're going to have be a project based day, meaning we'll all be working through the same project/pattern together. This day will be perfect for new sewers and anyone who has a fun project they'd like to share or work on together with the group. This will NOT be a class but there will be one person choosing and facilitating that day's project, so anyone who needs some support will have it. So the dates for April's meeting are the 9th (open sew) and the 23rd will be the project day. I've volunteered to lead the first project and I'm really excited to share this pattern - it's the Ali Foster Slouch Hobo bag. You can find Ali Foster patterns HERE in her etsy shop. This is a GREAT pattern for you novice bag makers out there, it goes together quickly enough that you'll be able to finish it in one session no problem! The bag in the top photos was done with two IKEA home decorator weight fabrics. You can use lighter weight quilting cottons as well, you'll just want to add a layer of canvas, fusible fleece or other interfacing to give it a little structure. For my next bag I'm thinking that I'm going to use this Echino for my exterior and a Kona cotton for the lining. Whipstitch has loads of great fabric choices if you'll be shopping on the sewing day. This pattern also includes a magnetic snap closure which is truly very easy and a great thing to learn if you haven't tried one yet. This bag is such a great simple shape and could be changed and customized so easily, I promise once you make it one time, you'll be ready to make another and another. For the sewing day on April 23rd you will need to purchase your own copy of the pattern and bring it with you - you can bring your own supplies OR find everything you need and more at Whipstitch. If I can answer any questions beforehand please don't hesitate to email me - moderncozy@gmail.com. Hope to see you there! they go together so quickly and suddenly you can see so many possibilities. Oh and because they're so stinkin cute. Then you have a realization that you're making these tiny things as much for yourself and the fun that you have just in the making of them. It's nice when something makes everyone happy. Especially when it comes in such a tiny package! These little bags were just basically two rectangles for the outside and two for the lining and a couple of tiny straps. I used fusible fleece on the outer fabrics to give them some structure and boxed the corners. Easy peasy tiny totes! There are *many* things I am not good at: algebra, giving directions, eating vegetables. I tell you this so that you won't think I'm being all braggy when I say that one of the things I AM good at is baking, cupcakes in particular. Someone around here has a birthday coming right up and these are the cupcakes the office will be celebrating with - Chocolate Stout Cupcakes with Cream Cheese Frosting and a few dark chocolate shavings - recipe courtesy of Dave Lieberman. Remember him, his show on Food Network? Wonder whatever happened to him? Ah well, I digress. I used the Left Handed Brewing Company's Milk Stout, because that's what we had in the fridge and even though the batter was extremely runny they seemed to bake up just fine. I haven't tasted one yet so the true test will come tomorrow. Oh and that adorable cupcake stand? Vessels and Wares on etsy - local ceramic artist Jeanette Zeis, whose work I love. If you're local and you ask her nicely, she'll even let you come by the studio and pick things up to save on the shipping costs - how great is that? Life has been pretty busy around here lately and doesn't look to slow down until the beginning of April (come on April, and yes, I know it's only the very beginning of March). I'm trying to get things done in little pockets here and there but honestly it doesn't feel like I'm getting much done at all these days - too many things in progress if you know what I mean. Thank goodness for cupcakes, usually a project that can be started and savored the same day!